Shoes are essential to our well-being whether we’re passionate about them or not. Some closets have shelves and shelves of shoes. Other people may have a style or two that they favor and buy over and over again, keeping their selection to a minimum. I’d like to give you some shoe support. Your feet deserve that and more. To satisfy your specific fit needs, you really have to put some effort into it. Just like jeans, you have to try on many pairs of shoes to find what’s right for you. Go shoe shopping when you have time and patience. Don’t give up. Don’t assume anything. While you think you couldn’t possibly wear heels, there may be a shoe just waiting for you that has the perfect look, the perfect arch support and the perfect pitch to fit your foot and raise your heel off the ground. Finding good fit is often easier to come by in flats, loafers or oxfords versus shoes with higher heels. Laced flat shoes offer more fit leeway because you can adjust the laces for a wide or narrow foot. ♦ If swelling is an issue for you, choose a shoe with wider straps versus narrow ones. Always try to shop in the later half of the day for shoes when swelling can effect the fit! If your ankles are thick, avoid wearing booties that stop at the thickest point. Likewise, avoid wearing a mid-calf boot height if you have thicker calves. If you’re wearing a knee-high boot, make sure it doesn’t hug so tightly that the flesh around your knees bulges out. The point is to have your short, medium or tall boots stop at a part of your leg that is not the thickest. ♦ Did you know they make boots specifically for “wide” and “narrow” calves? Leather can stretch but not a whole size. A shoe sales person can often stretch a shoe in a specific area versus stretching the entire shoe. Ask for what you need! Don’t expect silk, patent leather, or fabric shoes or heels to stretch at all. Take your shoe off and lay it on bottom of your opposite foot, how wide is your foot compared to the shoe? How do your toes sit in the toe box of the shoe? Pay attention your natural toe and foot shape and choose a shoe that mirrors the shape. Get square toe shoes if toes the same length all across. ♦ Any cramping of the toes can distort the shape of the toes and toenails (and can even make it appear that you have a fungus issue when you don’t – that happened to me!). When shoes hurt, you have no other choice but to stop wearing them. Forcing your feet to adjust to an ill-fitting shoe can cause injury and in some cases permanent damage. Purge your shoe collection to eliminate the sources of pain. Delicate ballet flats offer no cushion for your feet. Avoid wearing them on high foot traffic days. An alternative is to ask your shoe repair person to add a rubber sole to the bottom of your ballet flats. 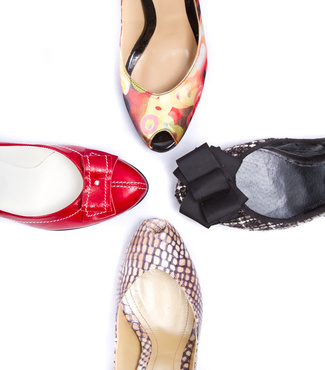 For foot and calf comfort, it’s best to have variety in your shoe wardrobe. Alternate between high and low heeled boots, booties, pumps and flats. Getting stuck in one shoe style can cause a problem down the road. Crepe soles will give you more cushion and comfort on days when you’re on your feet a lot. Shoe inserts can be a comfort fix. They are often sold in shoe stores or are available in drugstores. More serious foot problems require visits to a podiatrist. Carry moleskin or blister remedies with you when you’re wearing new shoes for the first time. While you’re breaking them in, your feet may need some foot aides. ♦ Make friends with your local cobbler. He or she can stretch leather, pad a shoe in the front or the back to make it more comfortable, remove stains, or weatherize them. Your investment will last longer with his or her services. While your foot needs change, you may need to explore different shoe manufacturers from the ones you’ve been using. You may also need to spend more money on shoes to get the performance you’re after. This is an excellent investment in your wardrobe. If you need to spend more for your shoes this year, spend less somewhere else. It’s worth it. ♦ Also – Please share your shoe favorites for fashion, fit and function, I’m always open to new ideas! Jill, here’s one of my favorite pair of shoes. Considering that I have very wide, arthritic feet and have had bunion surgery, I struggle to find dress shoes; and wearing heels is nearly impossible. Enter the Mona style by Aravon (from New Balance). With a bit of a heel and an adjustable strap, this is my go-to dress shoe. (They’re available in Rochester too . . . at Lair’s Shoe Store. Jill, since my husband is a marathon runner, we have multiple options in our house to make shoes more comfortable. One thing from a man who puts thousands of miles on his shoes, he says to not be afraid to spend and invest in your shoe ware. That goes for running shoes, walking shoes, and day to day shoes. In the midst of his array of running aides, I found a product called 2Toms Sport Shield that helps me with my sandals in the summer. Many companies make it but this is the one I use. It’s a roll on and I apply it on the sides of my feet or the heel where a sandal may rub but this lubrication decreases that irritation. It doesn’t come off on the shoe but be careful walking barefoot on a slippery floor if some got on the bottom of your foot. Sometimes I put it on with a new shoe until it is worn in enough to not cause a blister. It has saved me many times. I take it with me in my luggage when traveling, too.